"Mount Olivet" redirects here. For other uses, see Mount Olivet (disambiguation). The Mount of Olives or Mount Olivet (Hebrew: הַר הַזֵּיתִים, Har ha-Zeitim; Arabic: جبل الزيتون, الطور‎, Jabal al-Zaytun, Al-Tur) is a mountain ridge east of and adjacent to Jerusalem's Old City. It is named for the olive groves that once covered its slopes. The southern part of the Mount was the Silwan necropolis, attributed to the ancient Judean kingdom. The mount has been used as a Jewish cemetery for over 3,000 years and holds approximately 150,000 graves, making it central in the tradition of Jewish cemeteries. Several key events in the life of Jesus, as related in the Gospels, took place on the Mount of Olives, and in the Acts of the Apostles it is described as the place from which Jesus ascended to heaven. Because of its association with both Jesus and Mary, the mount has been a site of Christian worship since ancient times and is today a major site of pilgrimage for Catholics, the Eastern Orthodox, and Protestants. Much of the top of the hill is occupied by At-Tur, a former village and now a neighbourhood of East Jerusalem with a majority-Muslim population. The Mount of Olives is one of three peaks of a mountain ridge which runs for 3.5 kilometres (2.2 miles) just east of the Old City across the Kidron Valley, in this area called the Valley of Josaphat. The peak to its north is Mount Scopus, at 826 metres (2,710 feet), while the peak to its south is the Mount of Corruption, at 747 m (2,451 ft). The highest point on the Mount of Olives is At-Tur, at 818 m (2,684 ft). The ridge acts as a watershed, and its eastern side is the beginning of the Judean Desert. From Biblical times until the present, Jews have been buried on the Mount of Olives. The necropolis on the southern ridge, the location of the modern village of Silwan, was the burial place of Jerusalem's most important citizens in the period of the Biblical kings. The religious ceremony marking the start of a new month was held on the Mount of Olives in the days of the Second Temple. Roman soldiers from the 10th Legion camped on the mount during the Siege of Jerusalem in the year 70 AD. After the destruction of the Second Temple, Jews celebrated the festival of Sukkot on the Mount of Olives. They made pilgrimages to the Mount of Olives because it was 80 meters higher than the Temple Mount and offered a panoramic view of the Temple site. It became a traditional place for lamenting the Temple's destruction, especially on Tisha B'Av. In 1481, an Italian Jewish pilgrim, Rabbi Meshullam da Volterra, wrote: "And all the community of Jews, every year, goes up to Mount Zion on the day of Tisha B'Av to fast and mourn, and from there they move down along Yoshafat Valley and up to Mount of Olives. From there they see the whole Temple (the Temple Mount) and there they weep and lament the destruction of this House." In the mid-1850s, the villagers of Silwan were paid £100 annually by the Jews in an effort to prevent the desecration of graves on the mount. Prime Minister of Israel Menachem Begin asked to be buried on the Mount of Olives near the grave of Etzel member Meir Feinstein, rather than Mount Herzl national cemetery. The armistice agreement signed by Israel and Jordan following the 1948 Arab–Israeli War called for the establishment of a Special Committee to negotiate developments including "free access to the holy sites and cultural institutions and use of the cemetery on the Mount of Olives". However, during the 19 years the Jordanian annexation of the West Bank lasted, the committee was not formed. Non-Israeli Christian pilgrims were allowed to visit the mount, but Jews of all countries and most non-Jewish Israeli citizens were barred from entering Jordan and therefore were unable to travel to the area. By the end of 1949, and throughout the Jordanian rule of the site, some Arab residents uprooted tombstones and plowed the land in the cemeteries, and an estimated 38,000 tombstones were damaged in total. During this period, four roads were paved through the cemeteries, in the process destroying graves including those of famous persons. Jordan's King Hussein permitted the construction of the Intercontinental Hotel at the summit of the Mount of Olives together with a road that cut through the cemetery which destroyed hundreds of Jewish graves, some from the First Temple Period. Graves were also demolished for parking lots and a filling station and were used in latrines at a Jordanian Army barracks. The United Nations did not condemn the Jordanian government for these actions. Following the 1967 Six-Day War and the Israeli occupation of East Jerusalem, its government began restoration work and re-opened the cemetery for burials. Israel's 1980 unilateral annexation of East Jerusalem was condemned as a violation of international law and ruled null and void by the UN Security Council in UNSC Resolution 478. As of 2010[update], the Jewish cemetery on the Mount of Olives has been targeted regularly by Arab vandals. Mourners have been assaulted. Notable graves that have been defaced by vandals include those of the Gerrer Rebbe and Menachem Begin. On 6 November 2010, an international watch-committee was set up by Diaspora Jews with the aim of reversing the desecration of the Jewish cemetery. According to one of the founders, the initiative was triggered by witnessing tombstones that were wrecked with "the kind of maliciousness that defies the imagination." The Mount of Olives is first mentioned in connection with David's flight from Absalom (II Samuel 15:30): "And David went up by the ascent of the Mount of Olives, and wept as he went up." The ascent was probably east of the City of David, near the village of Silwan. The sacred character of the mount is alluded to in the Book of Ezekiel (11:23): "And the glory of the Lord went up from the midst of the city, and stood upon the mountain which is on the east side of the city." An apocalyptic prophecy in the Book of Zechariah states that YHWH will stand on the Mount of Olives and the mountain will split in two, with one half shifting north and one half shifting south (Zechariah 14:4). According to the Masoretic Text, people will flee through this newly formed valley to a place called Azal (Zechariah 14:5). The Septuagint (LXX) has a different reading of Zechariah 14:5 stating that a valley will be blocked up as it was blocked up during the earthquake during King Uzziah's reign. Jewish historian Flavius Josephus mentions in Antiquities of the Jews that the valley in the area of the King's Gardens was blocked up by landslide rubble during Uzziah's earthquake. Israeli geologists Wachs and Levitte identified the remnant of a large landslide on the Mount of Olives directly adjacent to this area. Based on geographic and linguistic evidence, Charles Simon Clermont-Ganneau, a 19th-century linguist and archeologist in Palestine, theorized that the valley directly adjacent to this landslide is Azal. This evidence accords with the LXX reading of Zechariah 14:5 which states that the valley will be blocked up as far as Azal. The valley he identified (which is now known as Wady Yasul in Arabic, and Nahal Etzel in Hebrew) lies south of both Jerusalem and the Mount of Olives. Many Jews have wanted to be buried on the Mount of Olives since antiquity, based on the Jewish tradition (from the Biblical verse Zechariah 14:4) that when the Messiah comes, the resurrection of the dead will begin there. [unreliable source?] There are an estimated 150,000 graves on the Mount, including tombs traditionally associated with Zechariah and Absalom. On the upper slope, the traditional Tomb of the Prophets Haggai, Zechariah and Malachi is situated. Notable rabbis buried on the mount include Chaim ibn Attar and others from the 15th-century to present. Flevit super illam (He wept over it); by Enrique Simonet, 1892. The Mount of Olives is frequently mentioned in the New Testament as part of the route from Jerusalem to Bethany and the place where Jesus stood when he wept over Jerusalem (an event known as Flevit super illam in Latin). Jesus is said to have spent time on the mount, teaching and prophesying to his disciples (Matthew 24–25), including the Olivet discourse, returning after each day to rest (Luke 21:37, and John 8:1 in the additional section of John's Gospel known as the Pericope Adulterae), and also coming there on the night of his betrayal. At the foot of the Mount of Olives lies the Garden of Gethsemane. The New Testament tells how Jesus and his disciples sang together – "When they had sung the hymn, they went out to the Mount of Olives" Gospel of Matthew 26:30. Jesus ascended to heaven from the Mount of Olives according to Acts 1:9–12. Landmarks on the top of the Mount of Olives include the Augusta Victoria Hospital with the Lutheran Church of the Ascension and its highly visible 50-metre bell tower, the Mosque or Chapel of the Ascension, the Russian Orthodox Church of the Ascension with its tall white bell tower, the Church of the Pater Noster, and the Seven Arches Hotel. On the western slope there are the historic Jewish cemetery, the so-called Tomb of the Prophets, the Catholic Church of Dominus Flevit, and the Russian Orthodox Church of Mary Magdalene. At the foot of the mount, where it meets the Kidron Valley, there is the Garden of Gethsemane with the Church of all Nations. Within the Kidron Valley itself are the Tomb of the Virgin Mary, the Grotto of Gethsemane, and the nearby tomb of the medieval historian Mujir ed-Din, and further south are the tombs of Absalom (Hebrew name: Yad Avshalom), the Hezir priestly family and of Zechariah. 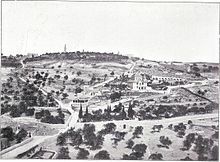 At the northern margin of Mount Olivet stand the Brigham Young University Jerusalem Center with the Orson Hyde Memorial Garden and the Jewish settlement of Beit Orot, bordering on the Tzurim Valley which contains the Temple Mount Sifting Project. What lays north of here belongs to Mount Scopus. On the south-eastern slope of the Mount of Olives lies the Palestinian Arab village of al-Eizariya, identified with the ancient village of Bethany mentioned in the New Testament; a short distance from the village centre, towards the top of the mount, is the traditional site of Bethphage, marked by a Franciscan church. The construction of the Brigham Young University Jerusalem Center for Near Eastern Studies, better known locally as the Mormon University, owned and operated by The Church of Jesus Christ of Latter-day Saints (LDS) near the valley separating the Mount of Olives from Mount Scopus, initially sparked controversy because of concerns that the Mormons would engage in missionary activities. After the Mormons pledged not to proselytize in Israel, work on the building was allowed to proceed. 2000 year old olive tree on the Mount of Olives. ^ a b c Har-El, Menashe (1977). This is Jerusalem. Jerusalem: Canaan Publishing House. p. 117. ^ a b Ussishkin, David (May 1970). "The Necropolis from the Time of the Kingdom of Judah at Silwan, Jerusalem". The Biblical Archaeologist. 33 (2): 33–46. ^ "International committee vows to restore Mount of Olives". Ynet News. ^ Hull, Edward (1885). Mount Seir, Sinai and Western Palestine. Richad Bently and Son, London. p. 152. ^ a b Har-el, Menashe (1977). This is Jerusalem. Jerusalem: Canaan. pp. 120–23. ^ Nom de Deu, J. (1987). Relatos de Viajes y Epistolas de Peregrinos Jud.os a Jerusalén. Madrid. p. 82. ^ Menashe Har-El (April 2004). Golden Jerusalem. Gefen Publishing House Ltd. p. 244. ISBN 978-965-229-254-4. ^ To Rule Jerusalem By Roger Friedland, Richard Hecht, 2000, p. 39, "Tourists entering East Jerusalem had to present baptismal certificates or other proof they were not Jewish." ^ Thomas A Idinopulos, Jerusalem, 1994, p. 300, "So severe were the Jordanian restrictions against Jews gaining access to the old city that visitors wishing to cross over from west Jerusalem...had to produce a baptismal certificate." ^ Armstrong, Karen, Jerusalem: One City, Three Faiths, 1997, "Only clergy, diplomats, UN personnel, and a few privileged tourists were permitted to go from one side to the other. The Jordanians required most tourists to produce baptismal certificates—to prove they were not Jewish ... ."
^ Bronner, Ethan; Kershner, Isabel (2009-05-10). "Parks Fortify Israel's Claim to Jerusalem". The New York Times. Retrieved 2010-03-27. ^ Alon, Amos (1995). Jerusalem: Battlegrounds of Memory. New York: Kodansha Int'l. p. 75. ISBN 1-56836-099-1. After 1967, it was discovered that tombstones had been removed from the ancient cemetery to pave the latrines of a nearby Jordanian army barrack. ^ Meron Benvenisti (1996). City of Stone: The Hidden History of Jerusalem. University of California Press. p. 228. ISBN 978-0-520-91868-9. ^ Har-El, Menashe. Golden Jerusalem, Gefen Publishing House Ltd, 2004, p. 126. ISBN 965-229-254-0. "The majority (50,000 of the 70,000) was desecrated by the Arabs during the nineteen years of Jordanian rule in eastern Jerusalem." ^ Tessler, Mark A. A History of the Israeli-Palestinian conflict, Indiana University Press, 1994. p. 329. ISBN 0-253-20873-4. ^ Blum, Yehuda Zvi. For Zion's Sake. Associated University Presse. p. 99. ISBN 978-0-8453-4809-3. ^ Mount of Olives description, from www.goisrael.com Archived 2012-03-20 at the Wayback Machine, retrieved January 4, 2012. ^ Matthew 21:1; 26:30, etc. ^ "Emek Tzurim". The City of David. 2009. Archived from the original on 2010-02-12. Retrieved 2010-07-16. ^ "Jerusalem - Beyond the Old City Walls". Jewishvirtuallibrary.org. July 22, 1946. Retrieved 2013-03-26. "Olives, Mount of" . Encyclopædia Britannica (11th ed.). 1911.